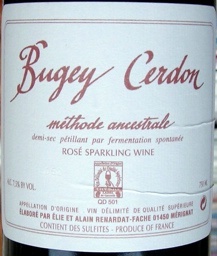 Brooklynguy, The NV Renardat-Fache Vin de Bugey-Cerdon Methode Ancestrale looks like a fascinating wine. I have heard of that style before, but never tasted it myself. From what I have read, Methode Ancestrale is not disgorged after the second fermentation. I am always up for an obscure style and will definitely look for that. BTW, the Chinon, pate, cheese, and salami from your farmers market lunch looks delicious. Very interesting reading. Hi Ben - thanks so much for your comments (and its embarrassing that your comment reveals more knowledge about a wine that I wrote about than I myself have). That was our best lunch in Chinon, btw - the one we put together ourselves and ate on the deck of our hotel. How did you come to this blog? Thanks a lot for your insights...will definitely keep it in mind during this year's celebrations.....and hey if you want more related resources then just visit my Thanksgiving Blog sometime and find out all that i've posted....well visit soon and have a great Thanksgiving!!!! That sparkler sounds great, Neil. Will be keeping my eye out for it! I profite of this post to tell you that I discovered a lovefull website with such great wines. I have to try it for New Year's Eve! Hey Brooklynguy, saw you link on the Dok's site. I like your Thanksgiving review - Chinons are not always easy to find, would you be ok with a California or other Cab Franc? I am not a big Pinot fan, but I love the turkey/Pinot combo (1,2). Cheers!